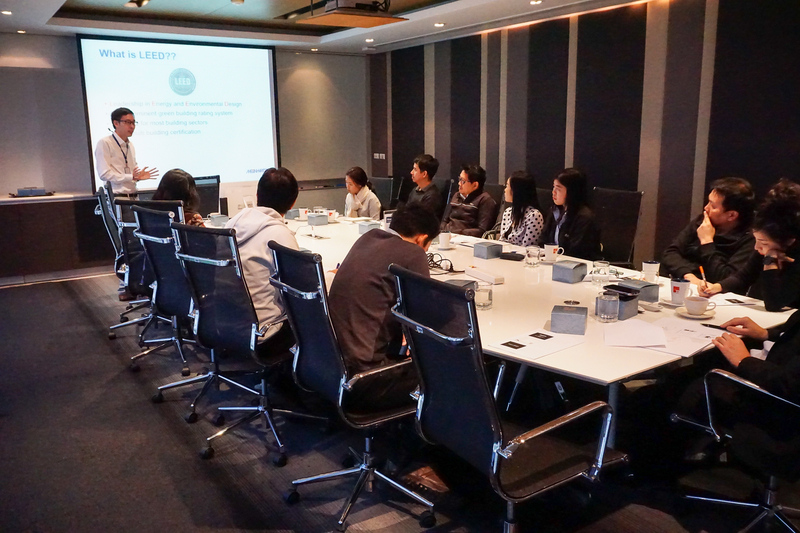 Meinhardt Thailand organized an Exclusive In-house Seminar on LEED v4 : the LEED of the Future by Lalit Thitipaisal, Environmentally Sustainable Design (ESD) Manager of Meinhardt Thailand. The seminar took place at Meinhardt’ s Conference Room on Wednesday, 20 December 2017, Bangkok. Leadership in Energy and Environmental Design (LEED), the most reputable green building rating in the world and Thailand, has been launched new version, V4, since 2013. However, it has been truly effective after sunset date of earlier version last year. All new registered projects must follow the new version. It is said that it is more complicated, demanding, and it impacts conventional design and construction practices. Is that true? This seminar will present overview of LEED certification, situation of LEED projects in Thailand, high level comparison between old and new version, and suggestion before starting new green building project. Meinhardt can arrange and manage reviews with the client and the project design team of the costs and benefits of achieving various LEED credits to identify whether pursuing LEED certification is feasible. Meinhardt can provide the project administration services required for LEED certification, using one of our LEED APs who has an in-depth knowledge of the rating system requirements and submission procedures. The LEED AP will be a key member of the design team who will monitor project changes and point out implications for LEED certification, facilitate consultant and contractor coordination and manage the documentation process for LEED certification. Meinhardt provides whole building Energy Modeling services which are integral to Green Building Design and LEED certification. Energy Modeling provides in-depth understanding of future building energy consumption related to building systems, envelop, orientation and operations and is a powerful design optimization tool. Based on hourly weather data, a whole building Energy Model will calculate system energy use; envelop heat gains and losses on an hourly basis for 365 days of the year. Integral to LEED certification is the requirement to carry out a systematic commissioning service. Meinhardt can provide the necessary management and coordination of the commissioning services to comply with LEED requirements and also to ensure that the building is constructed and handed over in accordance with the design intent. A properly commissioned building will generally achieve a better indoor environmental quality whilst also being cheaper and more efficient to operate. Meinhardt can provide the additional design analyses which are required for LEED certification, including daylight modeling, thermal comfort modeling and light pollution modeling. Meinhardt Thailand Ltd are the only registered low carbon consultants in Thailand. Members of the Low Carbon Consultants Register are a body of professionals competent to minimize energy use and carbon emissions from buildings both in design and operation. They are able to go beyond the current legal minima in improving the energy performance of both new and existing buildings.